More than one hundred years of expertise in publishing science experiment kits and games stand behind every product that bears the Kosmos name. Kosmos experiment kits and games are designed by an experienced team of specialists and tested with the utmost care during development and production. With regard to product safety, these products follow European and US safety standards, as well as our own refined proprietary safety guidelines. By working closely with our manufacturing partners and safety testing labs, we are able to control all stages of production. While the majority of our products are made in Germany, all of our products, regardless of origin, follow the same rigid quality standards. Series of Science Kits introduces various topics with exciting experiments and fun facts. Detective gadgets and gizmos in a range of blister packs and larger kits. Providing facts and information behind the science of sleuthing. Brand new series of bestselling topics with a wild twist! Fun and informative! Thames & Kosmos kits oďŹ&#x20AC;er hands-on learning through experimentation, model building, and include comprehensive full-colour books and instructions. The kits cover relevant topics that are pertinent to the world today and provide fun and enjoyable activities for eďŹ&#x20AC;ective learning. They consist of high-quality materials and custom-designed parts and have been safety tested for the United States and Europe. The Ooze Labs series is designed to introduce kids to chemistry in a fun and playful way. From single-experiment test tubes to the huge chemistry station, kids can safely explore chemistry with non-toxic chemicals and fun lab equipment. GLOW-IN-THE-DARK SLIME 775263 AGES 7+ SRP £4.00 Whip up a batch of slime that stores light energy and then glows in the dark! The Ooze Labs Point-of-Purchase Display holds 25 tubes and comes filled with assorted tubes. OOZE LABS UFO ALIEN SLIME LAB 642106 AGES 6+ SRP £25.00 EXPERIMENTS: 10 PIECE COUNT: 28 MANUAL PAGES: 24 As lead chemist in your very own out-of-this-world laboratory, it’s your job to identify UFOs — Unidentified Funky Oozes! Set up and use your lab station — separately or as an extension of the Ooze Labs Chemistry Station (a Parents’ Choice Silver Honour winner!) — to mix up batches of unidentified “alien” slime and conduct tests on them to analyse and investigate their special properties. Grab your beakers and test tubes and step up to your special Change I DIG IT! ROCKS AND FOSSILS to: laboratory station for some exciting chemistry experiments. See I DIG IT! MINERALS. Change the image, keep the same blurb. how much fun chemistry can be as you do slimy, fizzy, colourful, SKU: 1665173 and bubbly experiments. This cool laboratory setup has lots of BARCODE: different vessels and pieces of lab equipment so kids can play the role of chemist while doing real, safe experiments. Combine both Ooze Labs stations to create the ultimate chemistry laboratory! Discover palaeontology and geology! The I DIG IT! series includes a variety of excavation and model kits featuring scientifically accurate dinosaur models, real mineral and fossil specimens, and quality educational materials. Unearth your inner paleontologist with I Dig It! excavation kits! Discover dinos, fossils, and rocks in this series of kits with scientifically accurate models and quality educational materials. Build a 26-inch-long scale model of a T. rex skeleton and get exciting insights into this creature’s anatomy. The full-colour manual includes step-by-step assembly instructions and information about dinosaurs, prehistoric times, and fossil formation. A geological expedition in the palm of your hand! Each of these fun, low priced excavation blocks contains one real mineral or fossil specimen. The kits are blind packed, so it’s a surprise which of the 12 specimens you will get. The Minerals and Fossils display holds 24 assorted specimens. Each of these fun, low-priced dino egg excavation kits ADD IN MBE RANGE 8 PRODUCTS WITH IMAGES contains one plastic dinosaur model. The eggs are blind-packed, so it’s a surprise which of the 12 dinosaur Amazing Minerals figures you will get. A small chisel tool for digging the SKU: 1665296 dinosaur out of the egg and an instruction manual are BARCODE: included. The Dinosaur Excavation displays holds 24 assorted dino eggs. Bouncing Planets SKU: 1665277 BARCODE: I DIG IT! Excavate the minerals like a real geologist. Five different gems stones are hiding in the soft plaster material. Find out more about the minerals in the coloured instructions. Watch how beautiful crystals grow from the white crystal salt, some water and dye! You will also learn what crystals actually are and how their various forms come about. Whether it be balls, snakes or jellyfish – using this experimentation kit, you can form and study all kinds of slimy giant molecules. Become a slime master and carry out fun experiments! Use the special putty and plastic parts, to form cool monsters and funny aliens, simply attach the accessories to create your monster! The intelligent putty changes within a few minutes due to its special characteristics. Learn magic tricks step-by-step. Using the magic utensils in this kit and the coloured step-by-step instructions, performing magic will be a piece of cake! In Rocky Beach, California, live the three detectives: Justus Jonas, Peter Shaw and Bob Andrews. Together they are The Three ??? and there is nothing they don’t take on! The three friends witness exciting detective stories, solve puzzles no matter how tricky, and can always rely on one another. Using the alarm system, any drawer or cupboard can be secured. Should someone gain unauthorised access to the secret documents or evidence, an audible warning signal is sounded that scares off any intruders. Every detective needs a secret storage solution to keep those important clues safe! With the Cryptex this is easy. Write a combination number, programme it in and keep the code somewhere safe. Expose fake banknotes and write invisible messages - the UV light code comprising the integrated secret pen makes this possible. The UV light makes the invisible messages visible again. Light up various objects around you and find out which ones light up in the UV light and which ones don’t. Try this using stamps, paper or white clothing, for example. The multi-spy fits into any pocket. During investigations, the crime scene can be examined using a magnifying glass, ruler and a pair of tweezers. Messages are encrypted and decrypted using code discs and short messages and passwords can be stashed in the integrated secret compartment, for confidentiality. Periscope mirrors, a compass and a sundial can be very useful when tailing someone! When following a subject, you often need to gather secret information. Using the eavesdropping device, you can expose culprits! Point the microphone opening towards the sound source and hear it louder than without the device. Disturbing sounds from other directions are dampened by the listening spy. When going undercover it is diﬃcult to disguise your voice. Use the Phantom Voice Changer to pre-record sentences and play them back camouflaged to remain undercover. Protect your secret documents and other personal items in this Digital Safe. A 4-digit numerical code can open the safe and unauthorised access sounds a voice alert, warning you that a thief is at work. MASTER DETECTIVE TOOLKIT 630912 AGES 8+ SRP: £36.00 EXPERIMENTS: 26 PIECE COUNT: 33 MANUAL PAGES: 48 Grab this briefcase full of investigator’s tools and get ready to track down some crooks! Learn about how detectives use forensic science to answer questions, gather evidence, and solve crimes. Experiment with the equipment and techniques used by real detectives to develop your own observation and problem-solving skills. The interest grows, the fun grows, the knowledge grows. Brand new series of bestselling topics with a wild twist! Experimental fun with invisible forces. Learn how to build a compass and where the magnetic poles are. With additional magnetic games. New-style crystal breeding – grow large single crystals in a short time Grow large crystals with innovative methods. Create glittering elements in a magical crystal cave. Set up the pool and in less than 48 hours the first salt crustaceans will start to hatch and whizz around. Make luminous bouncing balls in just 10 minutes! Includes special glow in the dark granules and shapes for round and square bouncy balls. 3D PUZZLES Part of the exciting Nature Discovery range, these fun 3D models offer an insight into various animal species and inspires children to learn about our world and the animals that live on it. Each 3D Puzzle includes assembly instructions and a fun fact sheet about the animals’ behaviour and habitat. ANIMAL ANATOMY These fun 3D models offer an insight into animal anatomy and inspire children to learn about our world and the creatures that live on it. Each Animal Anatomy set includes a detailed model with detachable parts that can be easily assembled to show the internal organs and bone structure of an animal along with a fun and informative instruction manual providing facts about each animal and its habitat. Each Animal Anatomy set includes a detailed model with detachable parts that can be easily assembled to show the internal organs and bone structure of an animal along with a fun and informative instruction manual providing facts about each animal and its habitat. This detailed model teaches inquisitive biologists about human anatomy. Each kit includes a detailed model with detachable parts that can be easily assembled along with a fun and informative instruction manual providing mind blowing facts! With this detailed model inquisitive biologists can learn about human pregnancy. Each kit includes a detailed model with detachable parts that can be easily assembled along with a fun and informative instruction manual providing mind blowing facts! Triops are Crustaceans that are known from fossil records to have existed up to 300,000,000 years ago. This starter kit contains everything you need for successfully hatching Triops eggs – including feed and complete facilities for rearing and observation - so you can be close to the action when the small crustaceans hatch. In only a few days, they will hatch, change their armour and dart through the water. Our guarantee: Triops eggs in all Thames & Kosmos sets come exclusively from controlled and sustainable laboratory breeding and are not taken from the wild. The European species of Triops (Triops cancriformus) can grow up to three times the size of Triops longicaudatus! Watch on with amazement as these prehistoric crustaceans grow and learn how they have survived for millions of years. This kit contains all you need to hatch, feed, observe and breed your own Triops! Discover how these prehistoric crustaceans can survive in the most extreme environments. Grow plants that can grow in salty soil and watch as the creatures grow rapidly and whizz through the water! This entry level telescope has 12x optical magnification and a soft-shell ocular lens cover (eye-piece) for greater comfort. Young researchers are able to view the stars at night, watch wildlife or become sea going pirates. As with all Thames and Kosmos kits, this high-quality product ensures the scientific fun factor remains intact. Using this Binocular Microscope to view in 3D is a complete eye-opener! The 3D visuals make even the tiniest details really come into their own! Whole objects can be placed under the lens: - Rocks, flowers, flies or even banknotes can be viewed straight away without any complex or lengthy preparation. Just place on the object stage and view! The reliable mechanics, LED Light and high-quality coated glass lenses all guarantee precise focussing and clear examination of the objects. With x5 and x10 Ocular lenses and general sampling kit. Immerse yourself in a playful, imaginative world of STEM stories. Pepper Mint is an award-winning line of STEM kits with experiments and activities that follow the adventures of Pepper Mint, a curious, skillful, and creative young engineer. The experiments are presented in storybook manuals with beautiful illustrations and stepby-step instructions. As you read the stories of Pepper Mint’s adventures, you do the same projects and experiments that she does in the story. After assembly, the large wooden models become playsets where a child’s imagination can run free. THE GREAT TREEHOUSE ENGINEERING ADVENTURE 626020 AGES 8+ SRP: £35.00 EXPERIMENTS: 9 PIECE COUNT: 61 MANUAL PAGES: 32 In this story-based STEM kit, Pepper Mint visits her aunt who is a scientist living in a treehouse on the island of Borneo. They use lessons in physics to build equipment like a pulley, zip line, catapult, and more. The kit includes materials to build the treehouse and do the projects as well as an illustrated storybook manual and scale Pepper Mint figurine. THE FANTASTIC UNDERWATER SCIENCE VOYAGE 626037 AGES 8+ SRP: £35.00 EXPERIMENTS: 9 PIECE COUNT: 38 MANUAL PAGES: 32 In this story-based STEM kit, Pepper Mint accompanies a research expedition to the Bermuda Triangle. Using lessons in mechanical physics, electric circuits, and physical science principles related to air and water, Pepper Mint experiments with powering simple machines with the help of water. The kit includes materials to build a boat and do the projects as well as an illustrated storybook manual and scale Pepper Mint figurine. THE MAGNIFICENT MARS EXPEDITION 626038 AGES 8+ SRP: £25.00 EXPERIMENTS: 7 PIECE COUNT: 16 MANUAL PAGES: 24 Pepper Mint’s adventures continue, this time in space! In this story-based STEM kit, our creative young heroine goes on a mission to the Red Planet, making all sorts of out-of-this-world scientific discoveries along the way. As you read the story, you can embark on a scientific journey as well. First, you’ll use colourfully printed wooden panels to construct your own models of Pepper’s rocket ship experiment-and-play station and Mars rover. Then, it’s time for the experiments: From floating astronauts to magnetic slime, Pepper Mint accompanies you every step of the way! • Seven experiments in magnetism • Discover invisible magnetic ﬁelds with iron powder. • Help Pepper hover in the air using magnetic forces. • Control the Mars rover with a bar magnet. • Rocket ship playset can be used as the setting for your own explorations and stories. • Combine models from other Pepper Mint kits to embark on a creative and educational playtime adventure. THE DARING ESCAPE FROM HIDDEN ISLAND 626039 AGES 8+ SRP: £35.00 EXPERIMENTS: 7 PIECE COUNT: 11 MANUAL PAGES: 24 We all know Pepper Mint loves to investigate and explore, so it’s no wonder that when she hears of the mysterious Hidden Island, she immediately sets off to find it. But once she discovers it, she must use her ingenuity and scientific reasoning to get back home. In this story-based STEM kit, you can join our curious young scientist on her quest. First, you’ll use colourfully printed wooden panels to build an island experiment-and-play station. Then, it’s time to follow along with the storybook-style manual to conduct the experiments Pepper Mint performs. Through the projects, you will thoroughly investigate the topic of solar energy and its useful applications. Get ready to totally geek out on awesome science projects! GEEK & CO. SCIENCE is a series of science-themed project kits that put fun first to make learning truly approachable and entertaining. With each kit, kids build or make a tangible, lasting item — an object worthy of keeping on display or giving as a gift after the fun and educational process of creating it is over. Make a cool, bubbling lamp and learn some chemistry in the process. With this kit you can build a fun, oozing, fizzing lamp that uses oil, water and carbon dioxide gas from fizzing tablets. Learn about the different states of matter: solid, liquid, gas and plasma! Construct an electro-goop powered battery and use it to juice up a digital clock. Learn about electrochemical reactions, electrodes, and batteries. This kit uses a “magic wand” to show the stunning power of electrostatic energy which will inflate the included objects into 3D shapes and hold them invisibly in the air! Create your own crystal geode that glows in UV light! An ultraviolet flashlight with holder, as well as a display stand for the geode, are included. Display your beautiful specimen day and night and learn how crystals form! Make your own glow sticks in three colours using non-toxic phosphorescent substances and a special glow stick tube with a built-in ultraviolet light. Experiment with different glowing chemicals from around the house. Kids First is a line of science kits that allow parents to introduce scientific topics and hands-on empirical learning to young children, starting at age three, and gradually prepare them for more advanced science kits and schoolwork. This robot kit teaches coding principles and skills to children in keystage 1 without the use of a tablet, smartphone, or computer! An OID optical scanner in the robot reads a sequence of physical code cards and loads the program. A detailed manual guides kids through 30 coding lessons and the ADDITIONAL assembly of many different EDUCATOR MATERIALS robot models. AVAILABLE! This big, colourful microscope was designed specifically to enable young kids to have successful microscopic viewing experiences, and to be a fun tool for early biological investigations. The kit comes with 24 printed slides and one blank slide as well as a storybook-style manual that instructs kids how to use the microscope and guides them on a series of introductory lessons. Pre-schoolers and kindergartners have a natural curiosity to explore and learn about the world around them. This kit includes 24 large plastic scientific tools to ensure long-lasting fun and exploration. A 16-page, full-colour manual explains to adult supervisors how these tools should be presented to children, while illustrated experiment cards visually guide children as they observe and play. Read the funny story of two inquisitive kids, Ty and Karlie, and build simple, non-motorised models of the robots they construct and fix during their adventure to an automated candy factory. Includes durable storage case and storybook manual. Read the story of two inquisitive kids, Ty and Karlie, and build simple models of the vehicles they encounter on their comical trip to the supermarket with their dad. Includes durable storage case and storybook manual. Investigate weather with experiments on wind, rain, storms, clouds, temperature, evaporation, pressure, and more. Explore space by building a solar system, making moon craters and constellations, launching rockets, and testing to see which planets could support life. Become a wildlife sleuth with this fun kit! Discover garden creatures, learn how to track animals and explore habitats. Experiment with leaves, seeds and roots. Watch a plant grow through a maze and learn what it takes for seeds to grow. Budding botanists can get their hands dirty while conducting experiments in specially designed greenhouse domes. • Learn about plants and seeds. • Experiment in specially designed greenhouse domes. Begin a lifetime of scientific investigation with 29 fun hands-on experiments. This kit welcomes young children to the field of engineering with 21 experiments and building projects. • Experiment with simple machines like levers and pulleys. • Conduct engineering projects on land, in the air, and in the water. This science experiment kit contains many magnets of different shapes and sizes, and a variety of other components with which you can explore this classic scientific subject. Experiment to determine which materials are magnetic and which are not. Learn about magnetic poles and magnetic fields. Conduct a series of experiments to learn first hand how magnets behave and interact under different conditions. Learn about reactions between solids, liquids, and gases. Discover the colourful effects of acids and bases. Perform astonishing "magic" tricks for your friends. Make fizzy and foamy reactions. Write messages with invisible ink. Investigate metals and salts in electrochemical experiments with a 9-volt battery (not included). Learn for yourself how chemistry goes far beyond textbooks and laboratories to explain occurrences that happen around us every day. Build and erupt a model volcano with plaster based “lava” that hardens after each eruption. The volcano can be erupted multiple times, and the volcanic cone builds up with each eruption, like a real volcano. Learn about the different types of volcanoes. Build a working seismograph, and fake some ‘quakes to see for yourself how scientists measure earthquake forces. Build 20 solar-powered models to learn about how solar cells convert energy from sunlight into mechanical energy. Conduct experiments with the solar cell to see how different placement angles, different light levels, different sources of light, and different loads affect its operation. Learn about solar power in a fun, hands-on way. This kit includes a unique single-piece solar motor that is composed of a photovoltaic cell and an electric motor joined together in one compact unit. With this solar motor, you can power dozens of electric vehicles and devices. Electric motors and generators are in countless devices, appliances, and vehicles we use every day. They are an essential technology in our modern world. With this kit, you can conduct 25 experiments to learn how an electric motor converts electricity into motion, and how an electric generator does just the opposite, converting motion into electricity. The electric motor is made of transparent plastic to show how the inside components work. Set up the motor to run on battery power and learn how a motor works. Then reconfigure the device to work in reverse as a hand-crank electric generator. Engineering Makerspace combines the fun and creativity of makerspaces with STEM lessons. The line includes a range of kit sizes and price points. The modular construction system is compatible with the construction system used in Thames & Kosmos physics and engineering kits. Make five awesome machines and learn about the physics of force, motion, and energy. Models include a rubber band-powered car, a catapult, and more. The detailed manual guides your model building and experiments. Build five fun gadgets and learn about gears and transmissions! Models include a helicopter, spinner toy, hand-mixer, and more. The detailed manual guides your model building and experiments. Construct ten out-of-this-world machines and learn about the physics of levers and linkages. A batterypowered motor box powers the models. Build a creepy slithering alien snake-bot with rotating arms and articulating tail or an alien insectoid-bot that crawls on six legs. The detailed manual guides your model building and experiments. Build ten wild off-road vehicles and other machines while learning about belt drives, wheels, and tank treads. A battery-powered motor box powers the models. Construct a dune racer with tank treads that rambles over rough terrain or a four-wheel-drive A.T.V. with a belt drive and high-grip tires. The detailed manual guides your model building and experiments. Grow dozens of dazzling crystals and conduct 15 illuminating experiments with this classic science kit. Experiment with four chemically different crystals each with different properties. Mould fun plaster shapes and grow layers of crystals on them. Mix your own dyes to grow a rainbow of custom coloured crystals. Mould your own geode. Display your crystal creations in a clear treasure chest with a locking lid. Grow dozens of colourful crystals, including two types of crystals that glow in the dark. Experiment with growing a variety of crystals from a potassium alum salt solution. Mould fun plaster shapes, including moons, stars, neon signs, frogs, and gemstones and then grow layers of crystals on them, or mould your own crystal geode! Learn about the structure and geometry of crystals. Be amazed with the Giant Crystal. Create a plaster base for the crystal to grow and watch in astonishment as over time a giant crystal appears in the saturated solution. Discover how crystals form and how and why they have different structures. Soaring spires, towering arches, fascinatingly complex curves and angles! Build your foundation in architectural design with this fascinating STEM experiment kit that explores the engineering principles behind planning and developing buildings and structures. Through model building exercises you play the role of architect and engineer as you piece together an array of models, from small, basic structural elements like trusses, arches, and domes, to giant complex models of real-world buildings. Try building the Sydney Opera House, or put the Eiffel Tower on display in your living room! With 20 guided model builds, you can construct stadiums, skyscrapers, a ferris wheel, and more. By getting hands-on with these exercises, you’ll develop an understanding of how architectural engineers apply scientific principles to their designs and how the buildings and structures of the 21st century push materials and engineering to the limits. The 44-page, full-colour manual guides your journey while encouraging independent exploration. What is the tallest tower, the most voluminous dome, or the longest bridge you can build with the modular building pieces? How will you use what you learn to further your architectural journey? • Play the role of architect and engineer. • New ﬂexible building system mimics steel frames. • Explore the ﬁeld of architectural design. • Learn about modern day building materials and common architectural elements. • Challenge yourself to dream up your own designs. • Compatible with other Thames & Kosmos engineering and physics kits. Build your own motorised vehicles and machines and control them with a wireless remote control unit. A unique six button infrared remote allows you to control three different motors simultaneously, moving each of them forward or in reverse, with easy-toactivate touch sensors. The three motors can be combined to make complex vehicles and machines in numerous configurations limited only by your imagination. Physics Pro is our biggest, most advanced physics kit. With this kit, you can continue your study of statics and dynamics from previous lessons and begin your study of more advanced topics in physics, including fluid dynamics, energy, hydraulics, and pneumatics. Bring physics to life! The core of this science kit is an app-based video game in which you use real-world sensor data that you collect from your environment to generate a diverse array of creatures. Take temperature, sound, and light readings with the physical sensor pods and transfer the readings to the game via the base station. The sensor data dictates the attributes your bioengineered creatures will have. Create, collect, play with, and take care of your creatures in the app. Build an astonishing wall-climbing robot with a motorised air suction system that enables it to walk vertically up and down perfectly smooth surfaces like glass, plastic, whiteboards, and glossy laminates. You can also build six additional models and conduct experiments with suction to learn about air pressure and mechanical physics. A robot that defies gravity?! That’s what you get with Nexo, a four-legged bot that uses an ingenious system of suction cups and pumps to crawl along smooth, vertical surfaces like windows. A follow-up to the award-winning Geckobot STEM experiment kit, Nexo uses technology similar to that found in its reptilian predecessor, but with easier assembly. Nexo can crawl in a straight line, to the left, or to the right, while a special mechanism makes the robot’s head move back and forth as its body moves forward. You can also build four other models with the same components and learn how suction and mechanical devices can be used in different real-world applications. A vacuum-suction machine sticks to and lifts flat panels, while a robot with just two suction cups rotates around a central pivot point. This hands-on construction kit brings engineering and physics to life as it demonstrates the power of air pressure at work. A 32-page, full-colour manual guides your model building and experiments with clear step-by-step illustrated instructions. This kit gives kids a simple, fun, and customisable introduction to robotics that lets them build eight motorised machines controlled by programs and an ultrasound sensor. Build a humanoid robot that walks forward on two legs and pivots to avoid obstacles in its path. Code the programs using an easy, visual programming app on a tablet or smartphone, which connects to the robot models via a wireless connection. HappyAtoms A revolutionary approach to teaching chemistry This physical and digital system lets you discover the world of molecules in an intuitive, hands-on way. Assemble molecules using a set of magnetic atoms representing 16 different elements. Then use the included app (for iOS and Android devices) to scan and identify the molecules. The app teaches you about molecules and bonding with guided labs and open-ended discovery. Enroll in CHEM C1000 and prepare yourself for years of fascination with this essential science. You will have a solid overview of chemistry after performing the 125 diverse experiments in this kit. Experiment with air pressure, surface tension, acids and bases, “magic” tricks, household chemicals, indicators, electrochemical reactions, and chromatography. Discover how fascinating the world is when you understand the remarkable reactions behind ordinary occurrences. CHEM C2000 includes everything in CHEM C1000 and more — with twice the tools and materials. Most notably, this kit introduces you to the alcohol burner for experiments that require heat, expanding the number of experiments you can conduct. CHEM C3000 is the ultimate chemistry set. This kit includes all of the components from CHEM C2000, plus dozens of additional tools and chemicals, and 100 additional experiments (333 experiments total). The 192-page manual is written at a more advanced level than the other CHEM kit manuals, making it an excellent preparation for high-school level chemistry. Explore the fascinating world of chemical reactions that produce light, called chemiluminescence. Mix up a magical blue light in a test tube using the chemical luminol. Discover how the natural world is full of luminous mysteries: bright spots on bananas, fluorescent bark, and glowing sea creatures. Assemble a wind turbine complete with electric generator and adjustable rotor blades. Conduct experiments with your wind turbine, including experiments to optimise its performance by adjusting the angle of the blades. Use the wind turbine to light up an LED and charge a rechargeable battery. Convert the turbine into an electric fan by using the generator as a motor. • Build a three-foot-tall wind turbine that generates electricity and lights an LED or charges a battery. • Discover how wind occurs and why it is a promising source of renewable energy. Explore the power of water by building models and conducting experiments with them. Build a waterwheel, a sawmill, and a hammer mill to harness the energy of moving water to do different types of physical work. Construct a hydroelectric power station to generate electricity and light an LED. Learn about where the energy in ocean waves, tides, and rivers comes from, and discover how we can capture energy from them. Power House provides an engaging introduction to renewable energy sources and sustainable living, while teaching basic concepts in physical science. Through building a model house and 20 other energy related devices — such as a solar oven, a solar collector, and an air conditioner — you will learn about energy from the sun, wind, plants, and chemical reactions. Build models powered by air and water pressure to learn about the laws of physics. This unique kit allows you to build two different air-andwater-powered systems: water-jet propelled cars and hydro-pneumo (which simply means air pressure and water pressure) powered engines. The hydro-pneumo system uses a self-contained air-and-water turbine system as a motor. Construct circuits with colourful electric building blocks to learn about electricity and how electronic devices work. With the innovative snap-together blocks in this kit, children eight and up can safely and easily begin experimenting with electronic circuits. These building blocks are specially designed to make learning electronics fun and accessible. Conduct more than 60 electrifying experiments with circuits and magnetic contraptions to learn about electricity and magnetism, and how these two fundamental properties are closely related. Children eight and up can safely and easily experiment with electric current and magnetic fields using the colourful snap-together blocks and components in this hands-on kit. Magic is a centuries-old performance art that captivates audiences by appealing to their fascination with the inexplicable. 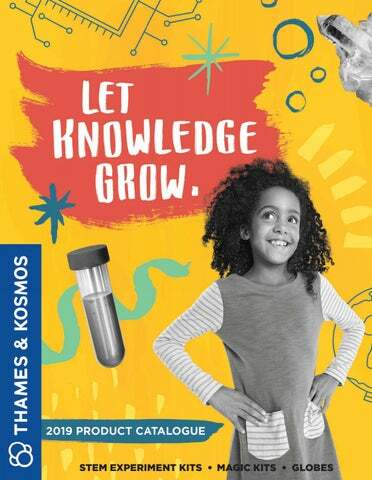 Thames & Kosmos oﬀers a line of comprehensive magic sets that help children develop presentation skills, confidence, hand-eye coordination, dexterity, and reading skills, while they have fun performing magic tricks and entertaining audiences. With the magic hat and rabbit puppet, as well as more than 40 other magic props, kids as young as six years old can learn and perform 35 magic tricks. The 100 tricks in this kit can be easily learned, practiced, and mastered—to stun and amaze audiences! With this extensive collection of magic props, you can perform 150 incredible magic tricks and illusions to astonish spectators! Prepare to astound! Follow simple illustrated instructions to perfect 200 magic tricks using high-quality props. TK1 TELESCOPE & ASTRONOMY KIT 677015 AGES 12+ SRP: £110.00 EXPERIMENTS: 20 PIECE COUNT: 15 MANUAL PAGES: 32 With this excellent entry-level telescope and astronomy kit, Kosmos continues a long tradition of inspiring people to reach for the stars. This high-quality refractor telescope with coated glass optics and plenty of accessories allows for countless exciting space observations. With it, you can see many planets, the moons of both Jupiter and Saturn, craters on the Moon, stars, nebula and galaxies. Features include quality optics, durable construction, sturdy aluminum tripod, and astronomy book. Use these cool, glow in the dark planet stickers to learn about our solar system! THAMES & KOSMOS GLOBES These high-quality globes are made of acrylic, rather than cardboard (like many other globes), making them extremely durable and sturdy. The process by which the map graphics are printed onto the globes ensures best-in-class resolution, brilliant colours, and fade resistance. These globes make educational and beautiful additions to any child’s room. They are manufactured in Germany by Columbus, the oldest and most respected manufacturer in the globe industry (established in 1909). This quality student globe gives you an informative overview of Earth’s surface right at your fingertips. Find answers to questions such as: Where is Tanzania located? Which sea surrounds New Zealand? What’s bigger: Europe or Africa? What is above the Arctic Circle? Country borders and geographical features of the individual landmasses can be grasped intuitively. Explore your planet with the Student Desk Globe! • Ten-inch durable acrylic globe with geopolitical boundaries • Learn about latitude, longitude, time zones, and more. This educational globe is a beautiful addition to any young child’s room. The globe functions in two modes: When the internal illumination is off, the globe displays a political map of Earth with clear country borders, bodies of water, and more. When the light is on, a different set of illustrations appears, including nocturnal animals. It also makes a great nightlight! This ten-inch-diameter acrylic globe has a light inside, allowing it to function in two modes. In its non-illuminated day mode, the globe displays a detailed physical and political map of Earth. You can see country borders, mountains, rivers, and more. When the internal illumination is on in night mode, a map image with the most important stars and constellations shines through from inside. ÂŠ 2019 Thames & Kosmos UK LP. 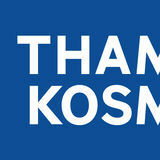 Thames & Kosmos and Circles Logo are registered trademarks of Thames & Kosmos LLC. All rights reserved.